Take nearly a century and a half of Fiocchi's experience manufacturing ammunition and combine it with over 65 years of Hornady's know-how in bullet production and what results is the line of high quality personal defense ammo known as Fiocchi Extrema XTP. When you load up your .40 caliber pistol in preparation for the worst, you'll want demanding standards and quality control on your side. 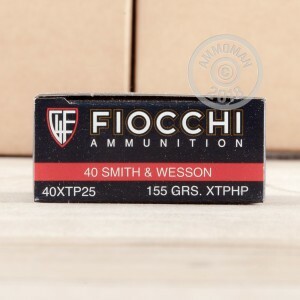 That's why Fiocchi, a longstanding Italian ammo company, uses premium components and maintains a reputation in the hunting, competition, and law enforcement circles for accuracy and reliability. These .40 caliber rounds have nickel-plated brass casings for smoother feeding and ejecting, as well as corrosion resistance. The reloadable casings are fitted with non-corrosive boxer primers and filled with a powder mixture designed to produce low flash even from short barrels. 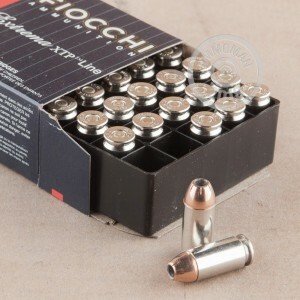 Fiocchi loads these .40 S&W rounds with a 155 grain jacketed hollow point (JHP) from Hornady's eXtreme Terminal Performance (XTP) line. XTP JHPs consistently expand on impact, even at low velocities from short barrels, due to precise serrations at the top of the bullet and a jacket of varying thickness which is thinner at the serrations. XTP bullets also feature a high quality cannelure which resists bullet setback during loading. The lighter 155 grain bullet flies with a muzzle velocity of 1,160 feet per second and produces 462 foot-pounds of energy at the muzzle.